To celebrate a decade of the National Television Award winning show – BBC One’s ‘Strictly Come Dancing’ – Sony Music has teamed up with BBC Worldwide and Dave Arch and the Strictly Come Dancing Band, to release the ultimate dancing album on Monday 24th November. Now in its 12th series, the nation’s best loved dance series has seen a host of celebrities and professional dancers take to the screen to entertain and delight us with their phenomenal dance routines, all performed to the wonderful sounds of Dave Arch and the Strictly Come Dancing Band. 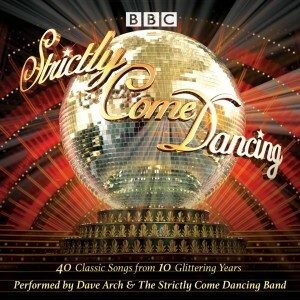 This brand new collection of 40 songs, as performed by Dave Arch and the Strictly Come Dancing Band, will give people their own chance to Waltz to ‘Kissing You’, Cha Cha Cha to the chart topping ‘Crazy In Love’ and Quickstep to ‘Don’t Get Me Wrong’. The ‘Strictly Come Dancing’ album also includes the arrangements of some of the show’s most celebrated performances and this is a must-have compilation for all budding dancers embodying an array of the music featured in Strictly. ‘Strictly Come Dancing’ also features an exclusive track from the band – ‘Dance Tonight’. Written especially for Strictly by Dave Arch, Tommy Blaize and the man in the hat and released for the first time on the ‘Strictly Come Dancing’ album, ‘Dance Tonight’ recreates the hot Latin feel of the Strictly ballroom as if it were Saturday night, every night! Dave Arch said: “We’re extremely excited to be releasing this fantastic collection of songs. We’ve recorded them exactly as we played them on the show, so you can sing and dance along to the routines you know and love. Dave Arch formed the Strictly Come Dancing Band in 2006, a band that includes some of Britain’s finest musicians – Trevor Barry (bass), Brett Morgan (drums), Frank Ricotti (percussion), Paul Dunne and John Paricelli (guitars), Pete Murray (piano/keys), and Jeff Leach (keys) with singers Tommy Blaize, Andrea Grant, Lance Ellington, Hayley Sanderson and Chris Madin. Whilst the nation is counting down to the all-important final to see who takes home the Mirror Ball, Strictly Come Dancing devotees are able to take a piece of the glitz and glamour home on Monday 24th November.